Geckos are colorful, nimble little lizards classified in reptilian family Gekkonidae. More than 2,000 species exist, inhabiting divergent habitats on every continent except Antarctica. Geckos are carnivorous, meaning the bulk of their diet consists of meat from other animals. Their teeth are adapted to their specific method of eating, as well as for hunting and self-defense. Most geckos have rows of small, conical teeth lining the premaxilla and maxillary bones on the upper jaw and the dentary bone on the lower jaw. Depending on the species, the premaxilla has between nine and 13 teeth; the number of teeth on the other bones varies due to repeated tooth loss and regrowth. Upper jaws usually have more teeth than lower jaws. In total, geckos average between 50 and 100 teeth, with exceptions. For reasons unknown, the leaf-tailed gecko has more than 300 teeth, most likely the highest number of teeth possessed by any terrestrial vertebrate. Geckos are born with fully formed, exposed teeth that are continuously lost and regenerated every few months throughout their entire lives. The replacement teeth develop automatically. They grow beneath the surface of the jaw until they push through the tissue and displace the existing teeth, ensuring that the geckos are always equipped with intact teeth. Because geckos depend so completely on fully functional teeth for prey consumption and protection, tooth regeneration is a vital element of their survival. Despite their copious numbers of teeth, geckos do not chew their food. Like other reptiles, they swallow food whole. Because they don't chew, their teeth are not precisely aligned to allow for shearing, slicing and grinding. Rather, their teeth are used to seize, crush and kill insect prey. They force whole insects down their throats using their tongues, jaw muscles and head movements. They may not use them to chew, but geckos utilize their teeth for other purposes. Self-defense is a necessary skill for small, vulnerable reptiles. 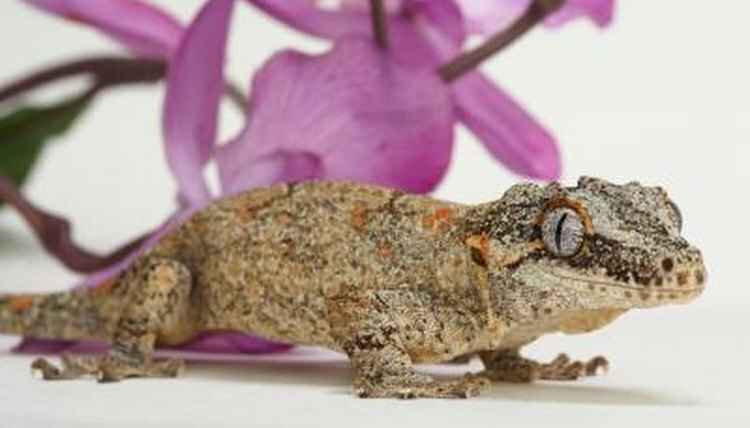 They're generally peaceful by nature, but if provoked or threatened, geckos will bite humans, predators and each other. Males especially,, are prone to violent fights over territory and females. They also use their teeth during the shedding process. Geckos shed their skin several times a year. They use their teeth to pull the old skin from their bodies, typically consuming it, as it is full of healthy nutrients. What Adaptations Does a Snapping Turtle Have?